Florida reacted to the Marjory Stoneman Douglas High School massacre by becoming the first state to require police or armed guards at all public schools. It’s a mandate many districts are struggling to meet, financially and logistically. In the first comprehensive statewide examination of the program, an Associated Press survey of Florida’s 67 countywide school districts found all campuses will be covered when they reopen this month, but many districts are having difficulty funding the program and finding enough applicants. About a third are supplementing officers with armed civilian security guards, including, in some cases, school staff members. Before the Feb. 14 attack, a few districts already had officers at every campus, but the majority of districts didn’t cover any or most elementary schools, and some didn’t staff all middle schools. Now every school must have armed protection whenever it’s open. In districts that won’t have full staffing in place when classes start, local law enforcement agencies are filling gaps by taking officers off the street or paying overtime. That’s happening in Palm Beach County. The district budgeted $9 million to add 75 officers to its 160-member in-house police department, and is asking voters to raise taxes to pay for them. But it isn’t getting enough applicants — Florida has several thousand police and deputy vacancies, and not just for schools. “There simply are not enough officers to go around,” said Kathy Burstein, Palm Beach schools’ spokeswoman. The district, which has nearly 200,000 students at 170 campuses, will not be arming staff or hiring civilian guards. The Florida Legislature budgeted $165 million to partially cover districts’ new security costs, but then cut proposed education spending. Before the massacre, Gov. Rick Scott recommended increasing the districts’ base allocation by $152 per student. Legislators, after passing the security package, cut that to 47 cents. The National Center for Education Statistics says a 2016 survey showed two-thirds of U.S. middle and high schools had an assigned police officer at least part-time; about a third of elementary schools were protected this way. Having an armed guard on campus doesn’t guarantee safety. The deputy at Stoneman Douglas didn’t confront the shooter who killed 17 people. Ten were killed in May at a Texas high school where two school officers exchanged fire with the suspect before he surrendered. But school officers have stopped other shootings before anyone was killed, such as one in May in Dixon, Illinois. The AP found 45 Florida districts are solely using police officers for campus protection. Most contract with law enforcement agencies to hire and employ them, while the few that have school police forces are expanding them. An experienced officer can cost $100,000 annually in salary, benefits and equipment, and any cost not covered by the state falls on local taxpayers. The staffing increases range from two officers in smaller districts to dozens in larger ones. Along with protecting students, such school resource officers investigate campus crimes, make arrests and can be reassigned off campus during summer and other breaks. Flagler County Superintendent James Tager said his district south of Jacksonville felt more comfortable sticking with deputies, many of whom become student mentors. He said little thought was given to arming staff. “Teachers teach and law enforcement does law enforcement,” he said. The other 22 districts are supplementing officers with “guardians” — armed civilians or staff. 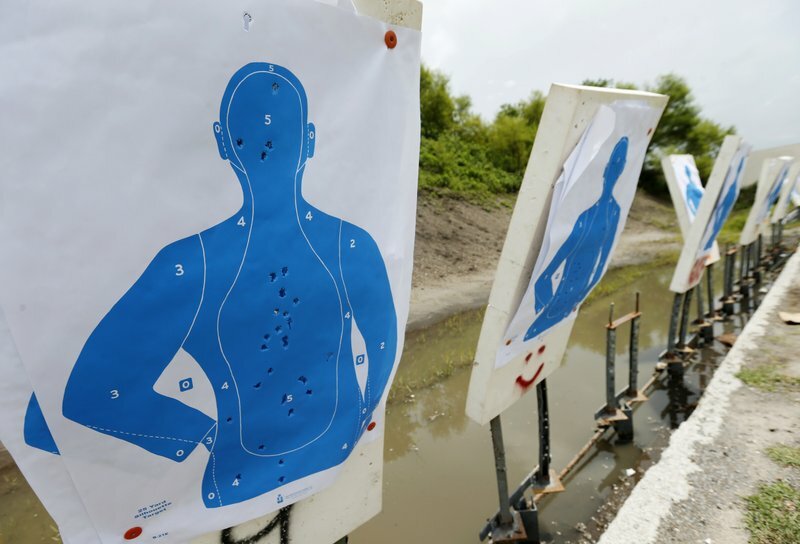 They are vetted, receive 132 hours of training and must attain a higher score on the state firearms test than rookie police officers. About 30 states allow school employees to carry firearms, with varying restrictions, according to the Crime Prevention Research Center. Florida joined them after the Parkland shooting, but left this decision up to each district. Thirteen of those districts, mostly rural, are arming volunteer administrators, custodians and other non-classroom staff members, who get a one-time $500 stipend. The law bans teachers unless they are former police officers, active military members or Junior Reserve Officer Training Corps instructors. The other nine are supplementing officers by employing full-time guardians, at an estimated annual cost of $30,000 to $50,000 each. Their sole job is stopping lethal attacks. They don’t have other law enforcement powers or responsibilities, and many districts are specifically hiring veterans and retired police officers. Six of the state’s 10 largest districts are hiring guardians, including 55 by Broward County, Stoneman Douglas’ district. 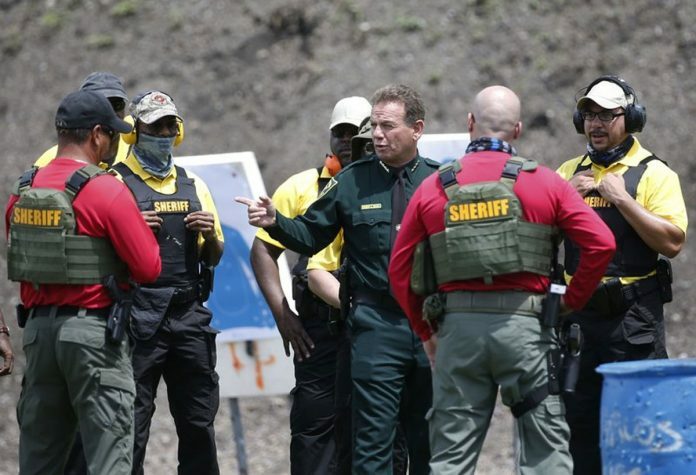 “To meet the goal of ensuring there is armed personnel on every campus, we are going to have to, in the short run, pursue multiple paths,” Broward Superintendent Robert Runcie said. Polk County Sheriff Grady Judd, an outspoken advocate of guardians, said they are cost-efficient while providing needed protection, but must be part of a larger strategy to identify potential attackers in advance and keep them out of classrooms. “Guardians are the last, best opportunity to keep children safe when all of the other layers have failed,” Judd said.